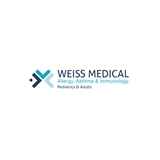 Weiss Medical - Allergy, Asthma & Immunology (Paramus) - Book Appointment Online! Conditions that are treated by Weiss Medical include (but are not limited to), asthma, hay fever, pet allergies, dust and mold allergies, food allergies, medication allergies, bee sting allergies, eczema, hives, skin rashes, Eosinophilic Esophagitis, and immune deficiencies. Patients are also seen for complications of their allergies, asthma or immune deficiencies such as sinusitis, pneumonia, bronchitis, and skin infections. Procedures performed in the office include allergy skin testing, pulmonary function testing, Exhaled Nitric Oxide, patch testing, medication challenges, food challenges, immunotherapy (allergy shots), Venom (bee sting) allergy shots, Xolair injections (for moderate to severe persistent asthma and chronic urticaria) and gammaglobulin replacement therapy (for certain immunodeficiencies). Dr. Friess is very kind, thorough and efficient. She made me feel comfortable and confident that she would find the cause for my reaction. Although we had a longer than usual wait time, Dr. Weiss is well worth the time! He is extremely knowledgeable and takes his time with every patient. He explains the treatment plans in full details and answers all your questions without feeling rushed. His nurses are also amazing and very good with the children! I highly recommend this practice for allergy and asthma!